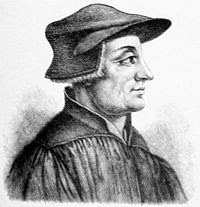 Zwingli, at least in his later years, did not believe Holy Communion was merely a memorial, but that Christ was truly present. but what a difference a Day can make! and we made children and heirs of God. Oh, Jesus, in deepest night and agony You spoke these words of trust and surrender to God the Father in Gethsemane. In love and gratitude I want to say in times of fear and distress, "My Father, I do not understand You, but I trust you." This stone plaque is located just outside the Church of All Nations, which is officially named the Basilica of the Agony. It is located at the foot of the Mount of Olives in Jerusalem next to the Garden of Gethsemane. “We are fools for Christ’s sake” (1 Corinthians 4:10). Thus speaks the great Apostle Paul who in the beginning was guided by worldly wisdom, which is against Christ, until he recognizes the falsehood and decay of the wisdom of the world and the light and stability of the wisdom of Christ. Then, the holy apostle did not become angry with the world because they called him “a fool for Christ’s sake” neither did he, in defiance of the world, hesitate to be called by this name. It is not of any value to us how the world is going to regard or call us. However, it is important, and extremely important, how the holy angels in the heavens will regard and call us when, after death, we meet with them. This is of crucial importance and everything else is nothing. Either we are fools for the world because of Christ or we are fools for Christ because of the world. O how short-lived is the sound of a word of the world! If the world would say to us “fool,” the world will die and its word will die! What then is the value of its word? But if the heavenly, immortal ones say to us “fool,” that will neither die nor is it removed from us as eternal condemnation. Whoever does not believe in the Living God, nor in eternal life, nor in the Incarnation of the Lord Christ, nor in Christ’s Resurrection nor in the truth of the Gospel nor in God’s eternal mercy and justice – is it any wonder if he considers that one a fool who does believes in all of this? O, may every one of us who cross ourselves with the Sign of the Cross not only find it easy to endure but with satisfaction receive the name “fool” for Christ’s sake! Let us rejoice and be glad if the non-believers call us such, for that means that we are close to Christ and far away from the non-believers. Let us rejoice and be glad and repeat with a powerful echo in the ears of the world: yes, yes, indeed we are fools for Christ’s sake!